Probably Australia’s largest fraud case involved John Friedrich, executive director of the National Safety Council of Australia. Friedrich embezzled almost $300 million from a number of banks through an elaborate scheme that was discovered in 1989. Just before going to trial, Friedrich committed suicide in 1991. An Australian publisher gave Friedrich a substantial amount to write his memoir and commissioned a young writer to help him complete the book. 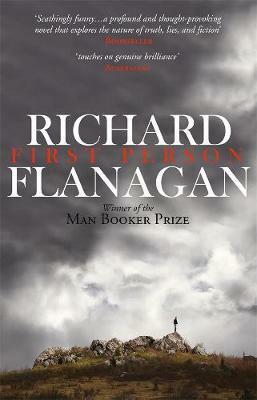 That young writer was Richard Flanagan. In First Person, another young writer, Kif Kehlman, is commissioned to help complete the memoir of Siegfried Heidl, ex-CEO of the Australian Safety Organisation, charged with embezzling many millions, awaiting trial. It’s tempting to draw parallels between history and fiction; how is Flanagan’s lived experience mirrored in the novel, if at all? As you read, you realise that the narratives diverge. Kif and his wife are expecting twins; they are struggling financially with their mortgage, secured through a solicitor at usurious interest rates, when he gets a phone call from, Ray, an old friend; would he be interested in a job? Ray is working for a man who needs some help writing and Kif’s a writer. As Ray explains more, Kif’s first reaction is no. He’s trying to finish his novel; the twins are on the way; Heidl is a crook. Just think about it, the money’s good. His partner Suzy agrees, but when he loses his part-time job, there doesn’t seem to be a choice. He’s a writer after all, and it’s okay to write rubbish if that lets him finish his novel. When he meets Heidl, he finds a man who is manipulative, deceitful, evasive, frustrating, intrusive – but sometimes charming and charismatic. He uses these attributes to exercise power over people around him, Kif included. ‘He was after your soul; he wasn’t quite evil, he wasn’t quite not evil.’ But Kif has entered into a Faustian pact and there’s nothing good here. In my opinion, this is Flanagan’s best work to date; it’s a book I’ve been constantly returning to – mentally unpeeling another of its layers, pondering one of its scenes or sentences, and admiring a writer who is on top of his craft. I feel so privileged to have read it. Mark Rubbo is the managing director of Readings.